This weekend my mum and I headed to Primark for a bit of a shopping spree! Primark always makes me a little sad because of them not doing a 'proper' plus size range - but we can only hope! That said, I never come out of Primark empty handed! When it comes to bargain shopping, Primark is another reason to IGNORE CLOTHES SIZES!!! Primark goes up to a size 22 if you are lucky, but often you can get items in a size 20. I can hear plenty of you going.. Oh I am much bigger than a size 20, that'll never work for me - but trust me it does!! This maxi skirt came with a hefty price tag of.... £10!!!! A tenner for a maxi skirt - amazing! I go around the store seeing what has stretch to it and this skirt didn't disappoint. 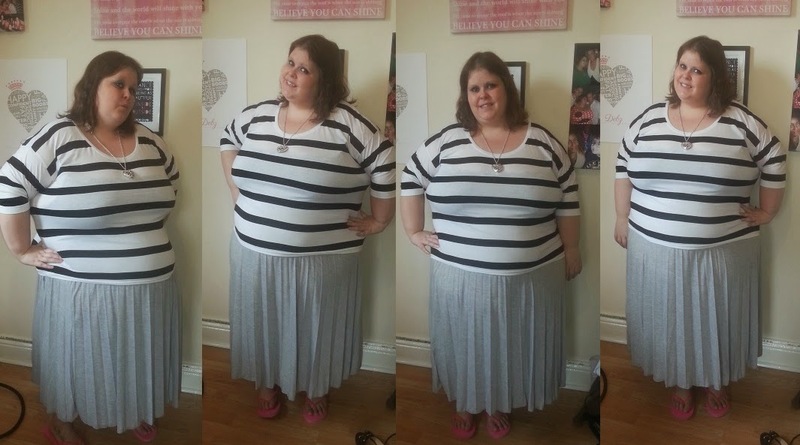 The skirt I am wearing in the pictures is a size 20... I am, as you can see quite a bit bigger than that! The skirt is really long (this is pulled up to right under my bust) so it would be perfect for someone taller too! It's really stretchy and generous, so it doesn't cling too much which I like for summer! It also comes in a massive range of colour and patterns, I wish I had bought more, and to be honest with you - I probably will go back for more. If you do just one thing next time you pass Primark, go in, play with the clothes, stretch the, hold them against your body and think about how you can make it work for you. I bet, most of you if you go into store with an open mind can find an item or two to suit you.